Out in Butler they had been experiencing on-and-off rain for weeks, and during our visit, it was no different. This particular day called for showers and every time we did a check on weather.com, the precipitation percentage changed, making it real hard to determine if we should go ahead and grill or not. Consensus was, yes we would light the charcoal and hope for the best. Within about 15 minutes of putting the chicken parts on the grill, the skies darkened, thunder started booming, and a huge deluge came raining down. As we heard the thunder approaching, someone turned the oven to 400 degrees in anticipation of rushing the partially grilled meat into the house, which is exactly what happened. What do you do in a case like this? Why, extend happy hour of course! So while the chicken continued to get happy, so did we! 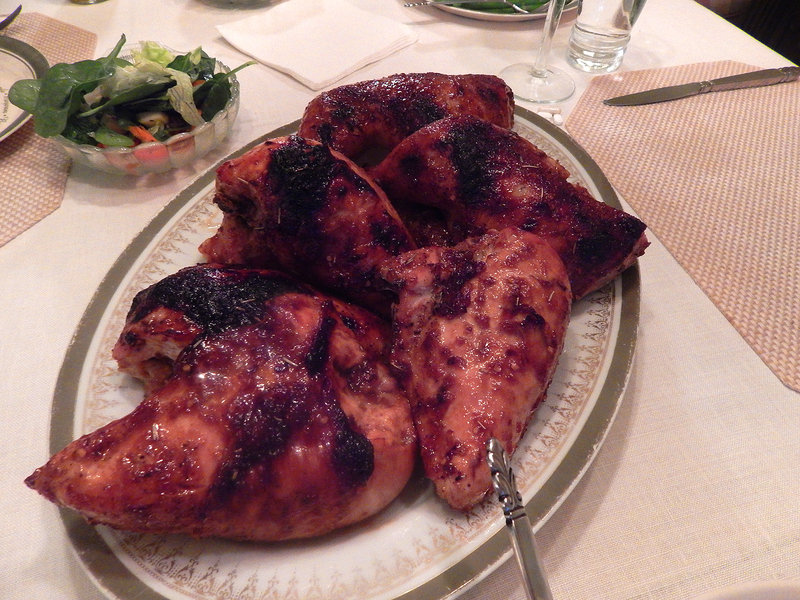 After about 40 minutes in the oven, the chicken and all the fixin’s were ready. The storm continued to assault the outside, and just as the platter of chicken was placed on the table, a loud crack of thunder boomed, and so I renamed the recipe “Thunderclap Chicken” — and all agreed it was probably one of the most flavorful and moist chicken any of us ever had! This simple lick-your-fingers, glaze-y chicken is perfect for a small cookout. The glaze has just the right amount of sweetness and can be made ahead. You can buy two whole chickens and cut them into parts yourself, or you can look in your butcher’s display case for bone-in parts that are about the same size—legs about 5 oz. each, thighs about 6 oz., and breast halves a little more than a pound each. PS- Thunderclap Newman was a British one-hit wonder band that Pete Townshend of The Who and Kit Lambert formed circa December 1968 – January 1969 in a bid to showcase the talents of John “Speedy” Keen, Andy “Thunderclap” Newman and Jimmy McCulloch. Their single “Something in the Air” was a 1969 UK Number One hit. I sense a “rainwater marinade” coming on. Unfortunately, we don’t have any rain here in CA!